Sing my love to my love. I am thighs and aching heart." 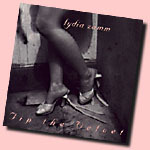 From the lilting melody and bittersweet lyrics of "Bird" to the brooding melancholy of "Lip to Lip," Lydia Zamm's debut recording, Tip the Velvet, breeds voluptuous femininity. This EP was recorded in 1994 with producer Jim Sclavunos, currently with both Nick Cave & the Bad Seeds and Congo Norvell and having previously learned his way around the studio in such bands as Teenage Jesus and the Jerks, 8-Eyed Spy, Sonic Youth, Tav Falco's Panther Burns, and the Cramps, just to name a few. Zamm and Sclavunos were abetted here by an ensemble of musicians which included Link Benka (Lydia Lunch and Rowland S. Howard's Shotgun Wedding album), Julia Kent (Rasputina) and Anna Domino among others. The traditional line-up of guitar, bass and drums was embellished with cello and sitar to create an exotic and dynamic melange of sound. Tip the Velvet was conceived as a "recording project," as Lydia wanted to document some of the songs that she had been writing for the greater part of her life which, until now, had never received "the full treatment." Previous to this output, there were only odd mentionings of Lydia in various fanzines. Maybe this record will begin to answer the question that Lisa Carver posed in an early issue of her acclaimed journal, Rollerderby. "Lydia Zamm is mentioned three times in this issue. What is her magic?"